Amplifys your voice and saves your throat. The sound is clear, crisp, no noise and no distortion. The max 10 watts sound can cover about 10000 sq.ft (1000 ㎡), loud enough to cover a big room. Compact size (4.1 x 1.4 x 3.4 inches) and light weight (0.36 lb). You can use the back clip to fix it on your belt or pocket. You can also use waistbelt to tie it around your waist or hang it on your neck. Built in 1800 mAh rechargeable lithium battery. Continously working time is up to 12 hours. You can use USB cable to charge this mini voice amplifier. Only needs 3~5 hours to fully charge it. Supports MP3 audio playing: TF (Micro SD) card playing & USB flash drive playing. Can repeat single tune, loop all music and switch songs. Supporting 3.5mm AUX audio input (Mic port can be used as AUX port), can work as a wired speaker. The wired headworn microphone is adjustable. You can adjust the distance between your mouth and the mic. 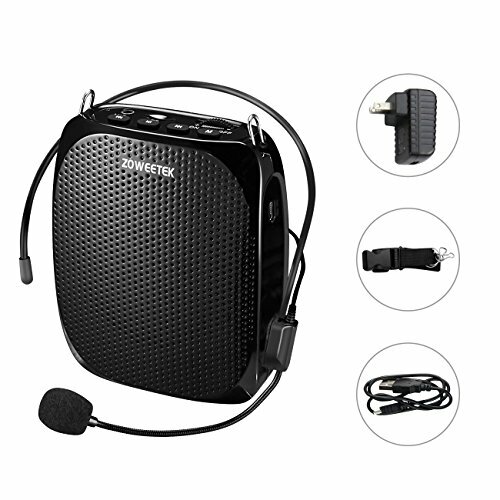 Made of durable and wear-resistant ABS material, this voice amplifier looks fashion. Suitable for teaching, trainer, singer, coacher, tour guide, shopping mall, presentation, outdoor speech and etc.. If you have any questions about this product by Zoweetek, contact us by completing and submitting the form below. If you are looking for a specif part number, please include it with your message.